Despite being reduced to 14 men for 35 minutes this will surely be a game that Down will bitterly regret. They had ample opportunity to win – manufacturing four more shots – but their shooting boots were just not on. Especially from play. Below are the outcomes from running the two team’s shots through 20000 simulations. 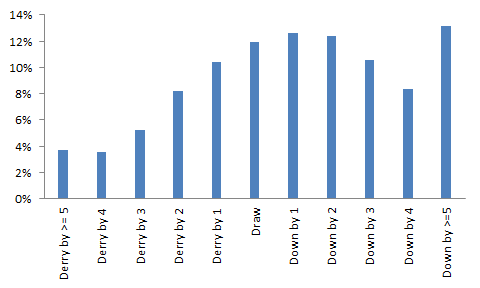 Down win the game 57% of the time with Derry winning 31%. It is not so much that Derry were “lucky” – this is after all why the games are played on the pitch and not on a spreadsheet – but Down will be kicking themselves. Yes being down to 14 men for the entire second half probably fed into mental & physical fatigue – reflected in poor shooting options – but even with the poor options Down should have scored 0 – 14. They *should* have won. What of Derry? In that second half they had 8 shots from 21 possessions. Down’s 14 men had 14 shots from 22 possessions. There really is no way you should be that far behind in terms of the headline metrics playing a full half with an extra man. Just a very poor second half outing from them. Neither team had a shot at goal – nor looked like manufacturing one. As mentioned Down’s shooting from play was very poor. Kevin McKernan hit two superb points in the first half but outside of that Down were 14% (2 from 14) with a combined weighting of -4.439 including some horrendous shot selection and execution. Lynch’s shooting was wonderful (3 from 4; weighting of +0.996) for Derry – especially those two points late in the first half that opened up the gap coming up to half time. 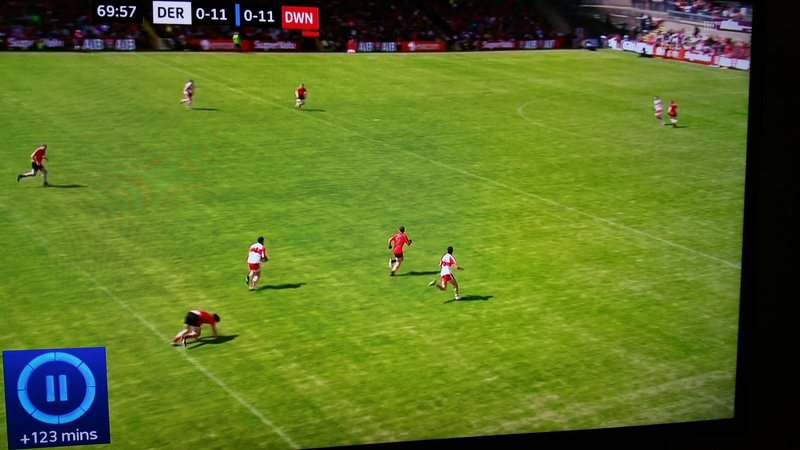 What should be of great concern however is the fact that Derry only managed 4 shots from play in that second half. Yes they were fouled on their way through but even accounting for frees Derry only managed 8 shots in the entire second half. Against 14 men. The average is 14. Speaking of frees … let me preface the following by stating I am not an advocate of cynical play. I’m not. It is just that I am very sensitive to last minute scores following Kildare’s collapse at home to Tyrone in the ’14 league. If you are going to attempt to stop a winning score in the final minute then Down went about it in a way designed to inflict most damage on themselves. The first picture below shows the pitch opening up after Bradley shrugged off the trailing Down player. Given that Down were willing to take a black card later in this move anyway then it was most advantageous to take it here – out the pitch where they still have a chance to regroup. That Down player just had to get Bradley to the ground when you see the wide open spaces in front of him. The second picture is taken a split second before the foul that led to the black card and ultimately the winning point. You couldn’t do it at a worse moment. You are beaten – by taking the player down you actually increase the chance of Derry scoring as they have a free that is converted at ~94%. Also, and almost more importantly, you waste a precious minute as the ref issues the black card and the opposition settles over the free. 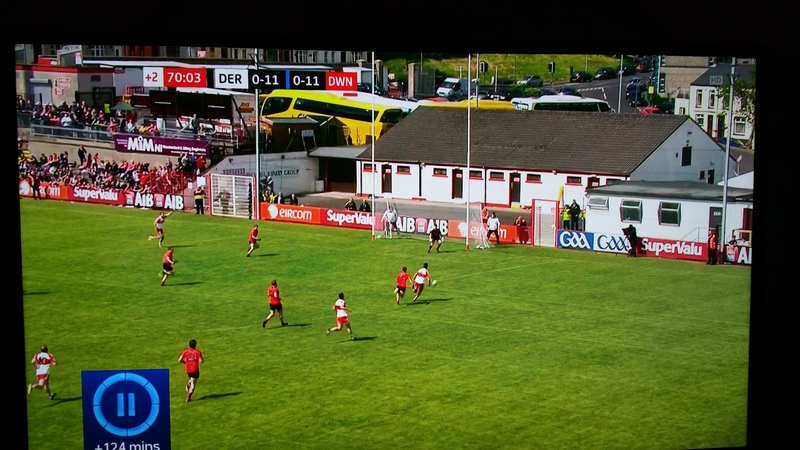 Just let the Derry man shoot – there’s less probability of a score plus you get an extra minute to get the equaliser. Exhausted players making split second decisions at the death I know but that’s when you have to be at your sharpest mentally. Watching the game it felt that every other shot was a free and up until ~53 minute it was. At that stage there had been 19 shots from play and 16 from frees. The volume of shots did not exceed those from play until the 33rd minute. Still that relative lull in the last 20 minutes only places this game on a par with Cavan – Monaghan this year for the second most shots from frees in a game – the *honour* of that title still lies with Meath – Tyrone in 2013. As noted above Lynch as excellent from play but his deadball shooting was poor missing one from the middle in two “gettable” shots from the wing in either half. On paper Devlin had a good day getting 0 – 06 from frees however his weighting shows that given where the attempts originated he was bang on average. His high tally had more to do with volume of shots rather than deadly accuracy on his part. As with other Ulster games we missed a number of instances where the ball landed so I’m loathe to read too deeply into how teams went about securing possession. I’m sure my need to see the kickout battle is not the producer’s target audience but man I really don’t need to see any more lingering shots of managers prowling the sideline – or the subs bench – when the game is on. Anyway …. This entry was posted on June 10, 2015 at 22:37 and is filed under 2015, Championship, Ulster SFC. You can follow any responses to this entry through the RSS 2.0 feed. You can leave a response, or trackback from your own site.